$10.00 each ~ 5 available-SALE PENDING! 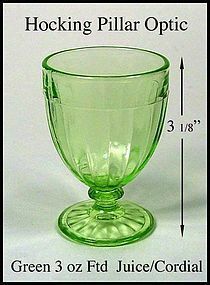 This green Pillar Optic footed tumbler was made by Hocking in the 1930's and it is in excellent condition! It holds about 3oz and is called a juice/cordial tumbler. We have 5 of these available for $10.00 each.